When your turn begins, lose 1credit. When the Corp's turn begins, draw 1 card. "Just a bunch of knockoffs for the touristos. The real designer stuff isn't sold on the street." This has to be the nicest drug dealer on the planet. "I'm sorry Mr Drug Dealer, I don't have any money for you this week." "That's okay Ken, I know times are tough. Have some drugs anyway, and pay me back when you can!" "I had the money for you yesterday, but then last night I got a bit carried away in the work shop and now it's all gone." "Perfectly understandable, Nasir! See you next week!" "I spent all my drug money upgrading my study guide, sorry." "Education is very important, Hayley! Stay in school!" "Yo Mr D check it out my supplier got me a sweet discount on this sports hopper." "That's... very nice, Tiger. Do you by any chance have that money you owed me?" "Sorry Mr D, I'm all out." "Sigh.... well, here's your free drugs." I once read that the fundamental runner strategy could be written down as "Draw cards, get breakers, get money, run." There are exceptions, Noisemill decks being the most common deviant, but most runners follow this general pattern. Drug Dealer helps one of these steps at the expense of another. Drug Dealer draws you cards, but costs you money. And it does so at the base rate of equivalency; 1 = 1 = 1 card drawn. So why would this be a good thing? Well, simply put, it's easier to turn cards into money than it is to turn money into cards. Take the simplest example, Sure Gamble. If you have a Gamble in hand, then the next time you would spend a click for a credit you can instead spend a click for a gain of 4. This means that the mere act of drawing a Sure Gamble is essentially worth 3. So if Drug Dealer gives you a Sure Gamble, he's paid off for that turn and the next two. But, you need money to run, and drawing cards doesn't help that. (Unless you're playing Faust, of course.) If you're spending all your Sure Gambles and Daily Casts just keeping up with your dealer, then you're never going to have the money you need to actually install breakers and get in when you need to. Meaning that if Data Dealer is your draw solution, you need to have a lot more economy in your deck, for two reasons. The first is consistency in your draws. If you've got 9 econ cards in a 45 card deck, you will see some money every fifth card on average...but you might have a dry spell of 7 or 8 non-econ cards in a row, and with Drug Dealer keeping you broke the corp has ample time to score out. Going up to 12 or more econ cards helps keep dry spells short. 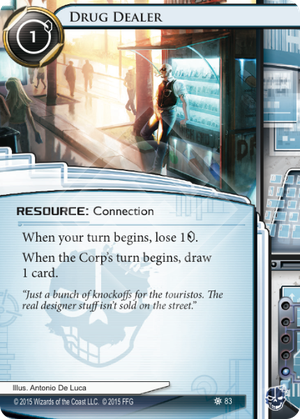 The other reason is that a lot of economy in Netrunner is impermanent. Event-based econ is single use, and Daily Casts, Armitage Codebusting, and Liberated Account all run out eventually. If these are your economy, then there are only so many credits you can efficiently gain, and many of those are going to get burned to Drug Dealer. So you either need to run a lot more of it, or fall back on stable, long-term investments like Magnum Opus, Kati Jones, Desperado, Underworld Contact, or Data Folding. Drug Dealer is a connection, and if you have enough other connections you can make use of Calling in Favors or double down on the draw with Off-Campus Apartment. It's not unique: you can potentially be having a three /three card swing each round. At only 1 influence, it's easy to move into other factions, although Shapers already have plenty of options. If you are running broke (with Faust, for example) then you can cheat the dealers out of their money. Drug Dealer CAN cause you to lose the game if you overdraw your deck. If you're afraid of this, you should plan to use Aesop's Pawnshop or Chop Bot 3000 to remove them before this becomes a problem. My favorite new card that makes playing on OCTGN a pain. Drug Dealer is at home in a connections deck where he can be tutored with Hostage at the beginning of the game and trashed before the end with an Aesop's Pawnshop. With The Supplier and Underworld Contacts installed you can use all kinds of start of turn shenanigans to lose as few credits as possible. With 1 credit in the bank, you can take 1 from a single Underworld, install Logos from The Supplier, trigger your Drug Dealers at no loss, and trigger your remaining drip economy. Call In Favors lets you bounce from near 0 to 10 or more to install an Overmind and close a scoring window. With Off-Campus Apartments on top of Drug Dealer, you gain monstrous card draw. You can burn through your deck by moving the connections you drew with Drug Dealer onto The Supplier and then into the Off-campus Apartment.